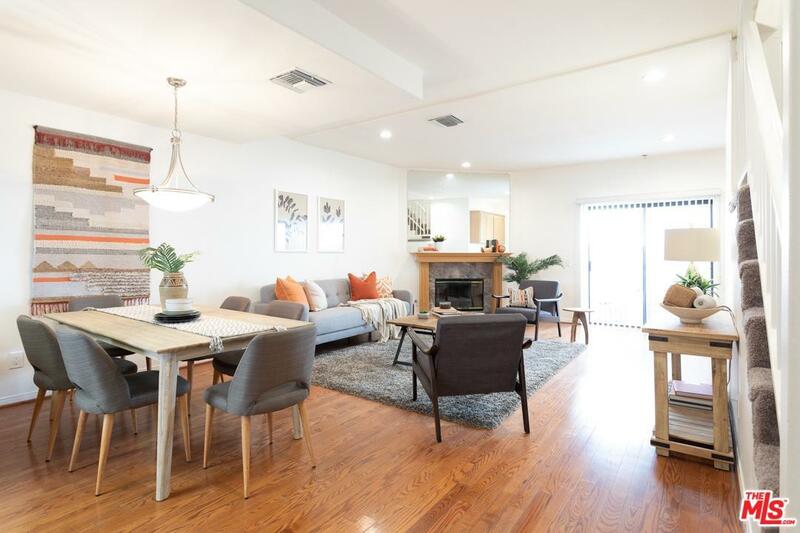 One of only six 3 bedroom, 2.5 bath townhouses with expansive private rooftop patio just one block from Melrose Ave, close to a variety of restaurants, comfortable cafes, and night lifestyles. Move-in or make this your own by utilizing every angle of the desirable townhome floor plan to create the condo's maximum potential by the buyer's taste & custom style throughout. Rare direct private entry into the unit from dedicated side-by-side parking spaces with ample storage closet. Open kitchen, dining, living, and reading nook with gas fireplace and wet bar offers easy entertaining options. Second level leads to 3 bedrooms including master bedroom with sliding door step out balcony and en-suite bathroom. Third level opens out to private rooftop with views of the Hollywood hills. Combining location, floor plan, in-unit laundry and potential makes this your opportunity to create a home.